John Landgraf, the erudite chief executive of FX Networks, warned that TV's golden age may be morphing into a gilded one, borrowing Mark Twain's zinger aimed at the late 19th-century's crass excess. Harsh! But it's true that TV has reached superstore proportions: streaming, cable and broadcast are on track to surpass the record 487 shows they fielded last year, with 300-plus shows already out by mid-2018 per an ongoing FX tally. The fall TV season officially kicks off next week and even avant-garde streaming platforms, which release ambitious shows nonstop, are part of the traditional September hoopla once owned by broadcast networks. So how to find quality goods? You might consider these tips brainstormed with TV and popular culture professor Robert Thompson of Syracuse University. — Do your homework. Viewers who once leisurely browsed through the schedules of broadcast networks for free now face a dizzying number of fee-based platforms and shows. Trusted publications and bloggers can help you sort through them. — Break out of your comfort zone. "Take a percentage of your viewing and watch things you think you're not going to like," Thompson says. Cable and streaming lean toward gourmet fare and networks dish out comfort food, but both can yield surprises. — Don't judge a TV series by its cover, aka the pilot episode. It introduces characters and provides a blueprint for where it intends to go, a heavy lift. It's a rare bird like "This Is Us" that starts out precisely realized. — Follow the work of stars you like but keep producers and writers in mind, too. When "Mad Men" creator Matthew Weiner unveils new anthology series "The Romanoffs" Oct. 12 on Amazon Prime Video, admirers of his late, lamented AMC drama will want to tune in. Which leads us to this fall's newcomers, a mix of "yes," ''maybe" and "why?" Here's a roadmap to a season that has something for everyone, and too much for all. Julia Roberts, the epitome of big-screen star power, is following the path beaten by Nicole Kidman and others to intriguing small-screen material. For Roberts, the lure is Amazon's podcast-based psychological thriller "Homecoming," in which she plays a social worker for returning soldiers. Nov. 2. 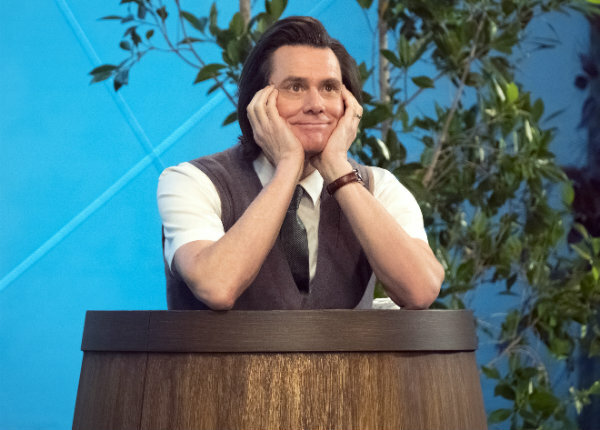 Jim Carrey stars in his first TV series, Showtime's "Kidding," created by Dave Holstein ("Weeds," ''Raising Hope") and with director Michael Gondry ("Eternal Sunshine of the Spotless Mind") on board for several episodes of the dark comedy. Airing now. "Superbad" stars Emma Stone and Jonah Hill are together again in Netflix's dark comedy "Maniac" as guinea pigs in a drug trial gone awry. It's directed by Cary Fukunaga ("True Detective," ''Beasts of No Nation"). Sept. 21. Jennifer Garner ("Alias") returns to her TV roots with HBO's "Camping," an outdoor test of marriage based on the British comedy and produced by Jenni Konner of "Girlfriends." David Tennant ("Doctor Who") co-stars. Oct. 14. Michael Douglas produced and stars (opposite Alan Arkin) in Netflix's "The Kominsky Method," a nuanced comedy about aging that's a departure for creator and sitcom hitmaker Chuck Lorre ("The Big Bang Theory," ''Mom"). Nov. 16. Benicio Del Toro, Patricia Arquette, and Paul Dano star in Showtime's "Escape at Dannemora," based on a headline-making 2015 New York State jailbreak. Funnyman Ben Stiller makes a sharp turn as the drama's producer-director. Nov. 18. "Magnum P.I." is yet another blast-from-the-past CBS title, but original star Tom Selleck is staying put on "Blue Bloods" while Jay Hernandez steps into the title role. A 21st-century twist: estate caretaker Higgins is a woman. Sept. 24. "Murphy Brown" and the original cast topped by Candice Bergen return in the CBS sitcom that jousted with politicians during its 1988-98 run. Creator Diane English is back and ready to enter the Trump-era fray. Sept. 27. CW's "Charmed" revisits the 1998-2008 supernatural drama with enough changes to make at least one original cast member issue dark mutterings. Melonie Diaz, Sarah Jeffery and Madeleine Mantock star as curiously gifted sisters. Oct. 14. "The Conners" is ABC's attempt to salvage a hit show and jobs from the wreckage of last season's revival of "Roseanne." With Roseanne Barr out, John Goodman, Sara Gilbert and other cast members take center stage. Oct. 16. The success of NBC's emotional rollercoaster "This Is Us" has not gone unnoticed, so prepare to hang on for more ups and downs. In ABC's "A Million Little Things," a group of friends are shocked into examining their lives after one of them dies, "discovering that friends may be the one thing to save them from themselves," as the network put it. The dearly departed (Ron Livingston) is seen in flashbacks, a comfortably familiar story device for "This Is Us" fans. Sept. 26. Brandon Micheal Hall ("The Mayor") stars as a radio host and atheist who gets a wakeup call in CBS' "God Friended Me." It takes the form of a social-media friend request that's apparently from on high and comes with demands. Sept. 30. NBC will counter at midseason with "The Village," set in a Brooklyn apartment building where "sharing walls means sharing lives." Presumably it's not in the neighborhood of M. Night Shyamalan's 2014 horror film of the same title. Date to be announced. Returning comedy veterans include Vicki Lawrence, David Alan Grier, Leslie Jordan, and Martin Mull in Fox's "The Cool Kids" (Sept. 28), Cedric the Entertainer in CBS' "The Neighborhood" (Oct. 1) and Sinbad as father to Lil Rel Howery in Fox's "Rel" (Sept. 30). Brad Garrett ("Everybody Loves Raymond") is on ABC's ensemble "Single Parents" (Sept. 26). Ryan Eggold ("The Blacklist") is a rule-breaking doctor in a medical center patterned after New York City's Bellevue, among the first of America's public hospitals, in NBC's "New Amsterdam." Sept. 25. Nathan Fillion ("Castle") stars in ABC's "The Rookie" as a man whose midlife crisis inspires him to become the Los Angeles Police Department's oldest newbie. Oct. 16. Kiernan Shipka, who played Jon Hamm's precocious daughter on "Mad Men," stars as a teenage witch in Netflix's comic book-based, coming-of-age tale "Chilling Adventures of Sabrina." Oct. 26. Alexander Skarsgard ("Big Little Lies," ''True Blood") and Michael Shannon ("Boardwalk Empire") star in AMC's three-night series "The Little Drummer Girl," based on the John Le Carre novel. Nov. 19-21. When "Sons of Anarchy" debuted in 2008, creator Kurt Sutter repeatedly heard the same comparison: it was the poor, white working class version of the HBO mob series, "The Sopranos." Television is in danger of storytelling overload with diminishing returns to viewers, FX Networks' chief executive said Friday. The peak TV era of expanding programming choices is at risk of moving into an ominous state of monopoly, FX Networks CEO John Landgraf said.